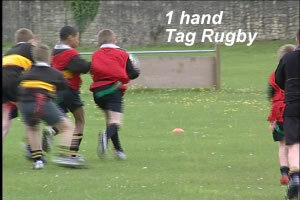 Rugby Single Tag rugby Tackling Start the session with a game of single Tag rugby. Players stand at equal distance away at differnt points along the grid. Line of defenders - 5m apart in staggered formation tackle shield. Players work in groups of 5 in a grid 10m x 10m, with 1 Ball per group. 4 Players work as a team to make 10 passes. The aim of the drill is to develop strong positive profiling and to develop core-stability. 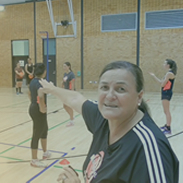 Start your session by splitting the players into two teams, one with bibs and the other without. Help - what are the rules of tag rugby? Play matches max. 5vs 5learning to run forwarsupport each other and pass when tag.